Low Cost CNC Part VII - It LIVES!!! So for the last, nearly two years, I've been working on building a low-cost, homemade, 3-axis CNC milling machine. Today for the first time, I can say that I've done just that, having finally actually cut something. As far as I know, it's the first milling machine build largely from 3D printed parts. You can see the entire process, from the beginning, in the previous six posts: Parts I, II, III, IV, V and VI. The mill is shown below, along with the 3-axis CNC controller that I've posted about before. The spindle is a low-cost Dremel tool, currently attached with a Shapelock bracket. It will no doubt get replaced with something less awful in the future (I am referring to both the Dremel and bracket, of course). I have a Rotozip spiral-saw bit in the Dremel tool, to stand in for a proper milling bit. It's a bit flexible, but more than up to tearing through MDF. The whole setup is shown above and gives a good sense of scale. My 3-Axis controller board is in the bottom right, controlled by my laptop. The CNC itself has around a 6x6x4" working volume, although this is arbitrarily expandable in the X-direction. The controller board runs GRBL, for which I have written a simple GUI for adjusting settings and jogging the machine. I plan to release the code for this when it stabilizes a bit, since GRBL needs a decent GUI. 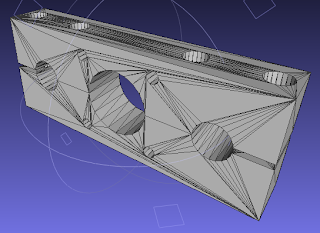 I intend to add some basic features, like simple pocket/contour milling. But for the time being, it's simply a software pendant. So with everything set up, it was time to start cutting. I attached my 3D printed iPhone mount to the XY table, started the Dremel, pressed record and began jogging the machine. The result is pure awesomeness, for me anyway. I had either the cutting depth or the feedrate too high for the spindle speed, since the bit began 'climbing', rounding the edges of the square when the feedrate was high. But guess what? I don't care! 'Cause the CNC that I started nearly two years ago, which has been my preferred hobby while simultaneously being intensely frustrating has finally, finally, cut something. Praise Jebus! Obviously there's refinement to be had. For one thing, the ~10 mm long square sides should actually be one inch. And I should make sure that the axes are actually square (I'd be shocked if they are). Also I want to package the electronics in the base extrusion, provide a proper power-supply, perhaps some heat-sinks on the stepper drivers and maybe attach a real spindle. And then there's ballscrews/belts. But that's for later. For the time being, my CNC actually cut something. To my knowledge, this is also the first milling machine built substantially with 3D printed parts. I hope in the not-to-distant future to get the feedrates up to the point of being able to 3D print with the mill itself. I also intend to build a tapping attachment to tap the holes used in the aluminum plates, which is -really- time-consuming and error-prone. This would make the machine as much of a RepRap as most 3D printers are, but considerably more solid. But that's for later. However it is very much a work-in-progress, particularly the installation. I hope to be cleaning this up and adding features as time goes on. If anyone has suggestions on how to package the code better, I'd love to hear them. In the meantime, the code is up on GitHub at: https://github.com/jamesgregson/pyPolyCSG, licensed under the MIT license. Please send your comments for new features, bug fixes or pretty much anything. Following up on Parts I, II, III, IV, and V, the machine gets a Z-Axis! With the addition of a Z-Axis the machine is starting to really come together. The main supporting column is a 4x4" square extrusion with 1/4" walls, mounted at 30 degrees. I'm hoping this will be stiff enough to be mounted cantilevered. It mostly passes the 'grab-and-pull' test, but I can feel it deflect a bit when I yank on it. Hopefully the forces during machining will be low enough for this to not be an issue. I used two Newport 360-30 angle brackets to build the main support. These normally retail for about $110 USD, but I was able to pick them up used for $38 each. Here's a detailed shot of the lower mount. This still makes them the most expensive part of the machine, but even with them, I think the mechanics could be built for about $100 per axis, including motors. I looked at a number of options for the supporting column, including welding a custom bracket, but all quotes came back at $300+. This cost less than $100 (including the column) and is pretty stiff. Plus I can re-use the brackets later. I still need to tweak dimensions a bit. As can be seen in the photo above, the Z-Axis is a bit low and doesn't provide much clearance over the XY table. I will probably add a spacer on the angle mount and drill/tap a few new holes to get a bit more clearance. I'm only shooting for about three extra inches. This should give the final machine a few inches of working depth, including perhaps a small vise on the table and a cutter. I may also flip the Z-Axis around and mount the plate rather than the carriage to the supporting column, which will give a bit more clearance but has other tradeoffs.